From the beginning of January consumers will be able to purchase I LOVE Cosmetics’ Candles and Reed Diffusers, award-winning Bath Salts and it’s all year-round Gifting products direct from the high street retailer. 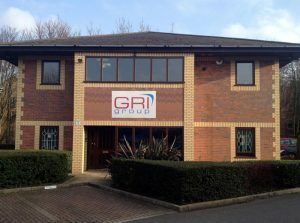 The products will also be available online via www.boots.com. 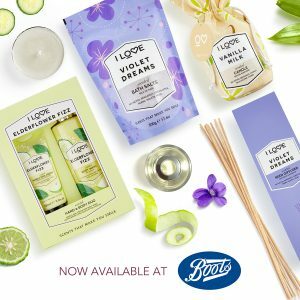 Boots will stock the ‘Signature Scents’ range which includes quirky flavour combinations such as Elderflower Fizz, Vanilla Milk, Violet Dreams, Glazed Raspberry and Exotic Fruits. Shoppers will be able to choose from Violet Dreams & Vanilla Milk scented Candle and Reed Diffusers, which are vibrantly packaged and retail at £15 each. The scented Candles (200g) have a burn time of 40 hours, and the Reed Diffusers (100ml) provide 12 weeks of long-lasting fragrance. From I LOVE’s bath and body range, consumers will be able to purchase the Pure Beauty Award-Winning Violet Dreams scented Bath Salts (£8) alongside bestselling flavour Glazed Raspberry. Completing the Boots line-up will be the beautifully packaged Hand & Body Duo Gifts which retail at £15 and provide all-year-round gifting options for those who are looking to treat someone special. These gifts are available in Elderflower Fizz, Exotic Fruits, Glazed Raspberry & Violet Dreams scents. I LOVE Cosmetics launched its Signature Scents bath and body range in July 2018. This was closely followed by its fragrances for the home and a series of brand new all-year-round gift boxes. True to I LOVE’s existing product line, all of the products stocked in Boots are Made in the UK & are Vegan Friendly. The Signature Scents range offers beautifully scented, indulgent, pamper products leaving both you & your home lightly fragranced. James Brown, I LOVE Cosmetics MD & Founder, commented: “What better way to start 2019 than securing the distribution of our award-winning Signature Scents range in one of the UK’s leading health and beauty retailers? We’re committed to making scents that make people smile sourced directly from the UK.